A few weeks ago, a customer stopped by our office with an odd looking belt: wood blocks were bolted to a rubber coated fabric on, roughly, one-inch centers. The blocks were about a half inch wide and tall with tapered sides. Even though it can sometimes get complicated and pricey, we take variable speed drive conveyors for granted today. Modern AC Variable Frequency Drives (VFD) and DC Silicon Controlled Rectifiers (SCR) make changing speed a simple, clean matter. Adjustments can be made at the push of a button. Ultra-modern controllers even allow us to control conveyor speed remotely through a network connection. Before we had those, we had wood block belt transmissions. Wood-block belt transmissions were developed by the Reeves Pulley Company in Columbus, Indiana. According to the Historic American Engineering Record, Marshall T Reeves founded the company. They owned a variety of businesses, making farm implements, steam engines, locomotives, automobiles, and power transmission equipment. Reeves has some 50 patents issued to his name. Marshall and his brothers Milton and Girney developed the drive for their tongue-less corn plows, the “Hoosier Boy Tongueless Corn Plow”. Here’s how it works: the belt rests between two discs. The discs are set on a shaft at an angle so that the tapered edges of the belt rest between them. A crank on the outside of the transmission housing allows the operator to adjust the width between the discs. As the discs tighten, the belt slides to the outer diameter and when the discs loosen the belt drops back towards the center. A tighter spacing means higher speeds and a wider spacing means slower speeds. Looking at the picture, the rear disc assembly was adjustable while the front was fixed. It works in the same way a 3-speed bicycle works. Operators adjust the drive-end spacing while the driven end remains fixed. Speaking of bicycles, the brothers Reeves used this drive assembly on what they called a “motorcycle”. Unfortunately, our modern definition of the word doesn’t accurately describe what they did. The “motorcycle” was built with a coach from the Fehring Carriage Corporation. The coach had a six-cylinder Sintz engine. 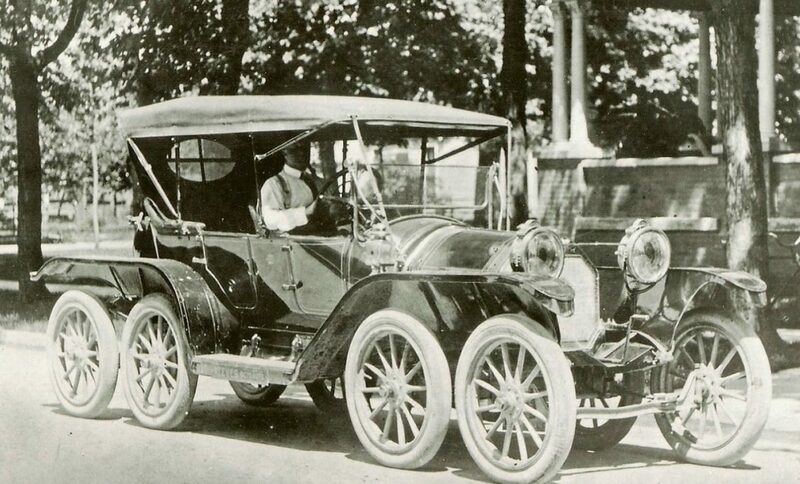 They successfully drove the car from Columbus to Indianapolis, Indiana in 1896. That’s 49 miles before paved roads. The brothers Reeves didn’t stop with their “motorcycle”. They developed six and eight-wheeled cars called the Sexto and Octo autos, respectively. The cars featured more wheels and more suspension to provide a smoother, gentler ride. At the time, roads were deeply rutted and riding in a car was not a comfortable affair. Reeves wood-block belt transmission in housing. Image via Library of Congress. Back to the belt drives, they were very popular in the first half of the twentieth century because they provided variable speeds from fixed speed motors. They were commonly found on lathes and other machine tools where variable speed was a must. They have waned in popularity, being replaced by VFDs and SCRs, both of which are solid state. Like most Victorian-era designs, they achieved a lofty goal through a highly complex apparatus. While wood-block belt transmissions are pretty cool looking, they are complicated and require maintenance. No matter how old your conveyor or drive, we can help. Need help with an old conveyor? Let's talk. Historic American Engineering Record IN-15; Library of Congress. The Unusual 8-Wheel Reeves Octoauto and the Sextoauto; Silodrome Gasoline Culture. PrevPreviousWelcome to our new website! Don’t over-look the Ford Model-T based snow mobiles! Your new location looks nice. Model-T based snowmobiles? Tell us more.